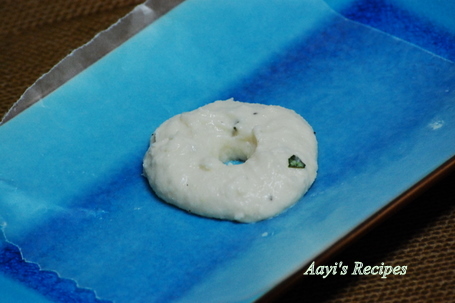 There are many names for this famous South Indian delicacy. These crispy vadas are loved by all. I remember while growing up, my brother used to pester aayi to make these often. She would serve it with coconut chutney. I have remained a fan over the years. I like to order these whenever we go to any Indian restaurant here or any restaurant in India. I love mine dipped in sambar. Everyone likes to flavor their vadas differently. I add curry leaves, green chillies and/or pepper, coconut pieces to mine. One of the basic requirements to get these perfect is to grind with very less water. I use my ultra grinder to make the batter. Ever since I bought this, I am making the perfect, crispy vadas at home. Soak urad dal in water for few hours. Grind it to a smooth batter without adding too much water. Now add coconut, curry leaves and pepper(or green chillies), salt. Apply some water to your palm. Take a small ball of the batter and give it a round shape. Make a hole (thootu) in the center. (Below I have used a parchment paper to help in taking picture. But palm of your hand works best in my opinion). Heat oil and slide these vadas very carefully. Fry till they are crispy. Serve while they are still hot with sambar and/or chutney. am sure these turned out great, but the rasam looks so delicious!! The Vadas look so crispy and yummmy in that sambar. Lovely!! Oh wow! I too love Medu vada. The crunchy exterior dunked in spicy sambar! YUM! I will make these soon, I now have a sumeet mixie gifted to me by my Mom! 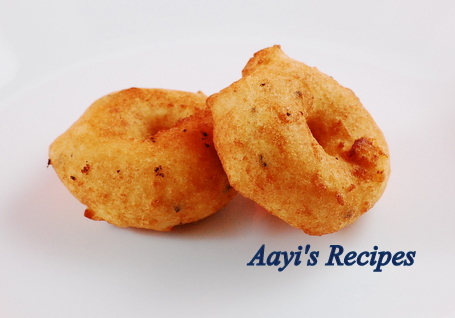 Co-incidently,im making these vadas today at home.Thanks for the tips and the recipe. Wow…Looks yummy. I always visit your site though this is the first time I am leaving a comment. I love vadas and I intend to make these tonight. Hi shilpa, i was always willing to try this vada. But i want to know one thing. How thick the batter should be so it should be good enough to keep it in hands and make hole? I mean that it should be much thicker than the normal dosa batter or normal round udad ambode we make. please guide me little more in the case of this vada. i want to know clearly the consistency in the thickness of this batter. Yes, much thicker than dosa/idli batter. Udad ambode batter should be good enough. Since ambode does not require round shape, it is okay to make it little thin, but if you can, make the batter thicker than that. These look like dougnuts…must go to little India neighborhood in Manhattan to see if I can find them made and then try my luck at making them. I have accomplished making nan and plan to learn more as the time goes by. Thank you so much for putting out there you Aais recipes. Could u please tell me how long it takes to grind the batter in an “Ultra grinder”.I think it takes more time when only a little water is added.Also does the grinder become hot?Your reply is highly appreciated. i had the same prob ..mixer getting hot…i did try but crispy on the cover but inside was hard not soft …why so/?? will adding 1/2 cup rice will soften and make it crispy …pls advise thnku.. Try applying water to palm next time. It seems your post is impossible to read since it is so tiny (font size). Please reload to readable size. Not sure why it is looking very small to you. It is very much readable to me. Please let me know your browser version. They look delicious. I like to add dry chillies and a little ginger to the dough while grinding. thanks. if you add onion,coriander leaves chop.it will get more tasty. aha shilpa, what lovely vadas, my son loves vadas with a hole in the middle which not a practice in our family.For this krishna jayanthi, when we have to make urad vadas and dahivadas, i made them by using a littleoil in the appe pan. I took this tip from one of your previous recipes where you fried veg balls in appe kadai.This process turned out to be a real success. I love urad vadas and I also use my ultra to make lovely big crisp vadas…the advantage being they are stone ground with as minimal water added as possible!!! Thanks for the delicious receipe. Lovely. I just want to grab that bowl with Sambar right away. Looks delicious and I have tried in the past and have always failed so I make them as bonda. That is what I did this Ganesh Chaturthi as well. Please visit my blog. I am new blogger and needs encourangement and guidance. Thanks for putting up such a great blog. u r from belgaum.or just i read ur recipes is too good. i want malvani fish fry recipe.pls reply me. Hi Shilpa, May I ask what oil you use to fry such goodies..I have tried using Canola but I don seem to like it…wat else can i use? I tried this and it came out pretty good. I have tried this Vada with a ready to make packet of MTR, it turned out really good, I just want to ask u, instead of soaking urad dal in water and then grinding it, can I use dry urad dal flour and then soak the flour in water for sufficient time until it ferments? i did apply water in my hand, it still sticks 🙁 , it even got stuck to some of my laddel.. pls help ..
Love ur site.. I tried these just now…they came out a bit too dense though were crispy enough…does it need some baking soda or does it have to rest for a while.. Thanks for the wonderful receipes..
love your site. I tpo love vadas, before i was grinding in mixie and not got perfect vada nor idly, so this time i purchased grinder and i tried vada, then also it is not coming perfect vadas, like your bloated, crisp, sand texture. I grinded for about 45 mts then also my vada didn;t turn good, finally i added some soda and fried. What could have gone wrong i don;t knoe, i soaked it for 4 hrs and i grinded for 20 mts and tried one vada, didn’t come good and again i started grinding for another 30 mts then tried again no luck. how to know that the batter is ready for frying. Thanks for posting this recipe. The serving quantity you have mentioned which is 2-3, is it in number of pieces or number of people?? 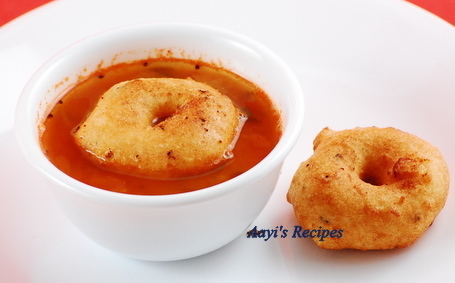 How on earth did you get the perfect shape with the hole in the middle of the vadai? I have tried like a gazillion times and I always ALWAYS end up with a bonda. Although they taste great. I’m sure I got the consistency right. If only I could learn to trick my hands into sliding the vadas into the frying pan as they are! Please please help. That was just practice. You need a thick batter. Just dip your palm in water and then shape the vada. I have seen the vada maker at friend’s place. So if you make them frequently, I would suggest investing in one. How long do you soak the dal for? And is it ok to not add coconut? Hi Shilpa, thanks for the recipee.. The dough is good if it sticks to a spoon when u pull it out of the batter and takes like 5/7 seconds to fall back in. Once u remove the dough u have got to aerate it with ur hand, i saw the dosa guy do it, it goes shiny white. i think u can chk out vahchefs method on youtube. ur hand should be soaking wet when u handle dough if u intend to hand toss. 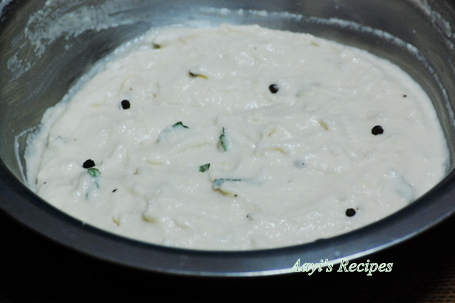 After grinding the batter can i make wadas aft 3-4 hrs jst keeping the batter outside the fridge or should i make it as soon as poss aft grinding ? I have the medu vada batter (with onions, chillies, ginger, salt, cumin, coconut, little baking powder mixed with the ground dal) left of yesterday. Have kept in the fridge last night. can anything be done of this batter? can it be steamed like idlis/sanna? Also i have nestle coconut milk powder, raggi (flour), rice flour and rice rawa with me. what can be done of these (not all together) or how to use the rice rawa.